Hello reader. You've been searching. Searching for an answer to a question that you are afraid to think. "What if the Ferengi were actually able to nullify dilemmas like the Federation or the Borg?" It's a question that might make you shudder to think of the answer. 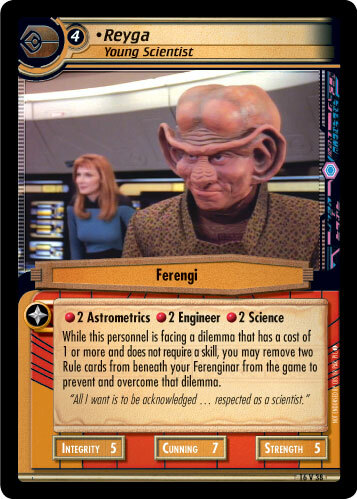 With the ability to prevent and overcome dilemmas, a person might actually have to face the Ferengi in tournaments on a regular basis. A sobering thought. ...or you can take the red pill...and together, we'll see just how far down the rabbit hole goes. You've chosen the red pill. I thought you might. Welcome, to the real Ferenginar. A world that has great potential though it is greatly untapped. As an affiliation, the Ferengi came onto the scene fully fleshed out in Strange New Worlds but have struggled to achieve greatness. At best, they have been used and abused for only one weapon in champion-level decks. More commonly though, they are simply ignored and even berated for their ineffectiveness. I have felt for a long time that all they needed to become competitive was a single card to reverse their fortune. A single card - the one. Reyga is the one. I believe he is the one and I believe that when our discussion has concluded that you will want to believe also. Why else would he have such a cocky, arrogant look on his face? It will not be an easy path. You will need to open yourself to the possibilities. Open yourself to new strategies. Train yourself to think differently. Learn to strategize differently. Learn to take the tried and true and make it work with the bold and daring. Search through your collections and re-examine every card. You will play with cards you have never played. You will use cards you have wanted to use. You will find ways to hoard as many cards as you can under your Fereginar. You will find ways to reduce, re-use and recycle. Are you ready to believe? Will you heed the Call of the Nagus? Now follow me to Part 2 and free your mind.